Grades of Green will be celebrating our ten year anniversary on April 20th at VERTE 2019, and Facebook’s #TenYearChallenge has Grades of Green thinking about where we were ten years ago. As we reflect on how Grades of Green has grown, we are excited by how our organization has evolved. Our student Eco-Leaders around the world are proving that the future can be sustainable. How has your business evolved in the last ten years? Have you considered applying for LEED, GBB, or a Green Seal Certification? How can your business operate with sustainability in mind? Would you believe that you can actually save money in the process? Here are seven sustainability solutions for small businesses (and not-so-small businesses). It may not come as a surprise, but nearly everyone commutes to work by car. The US Census Bureau reported that over 85% of American workers drive to and from work every day. Three fourths of those commuters drive alone. You can use My Map Emissions to measure the environmental impact of your personal commute. You can even compare the carbon footprint of commuting by automobile against commuting by public transportation, or cycling. So what can your business do? Encourage employees to start car-pools. Ride sharing can cut down on gas costs, in addition to reducing carbon emissions. Offer employees who travel by bicycle or public transit an added perk, such as more flexibility in their schedule. Find the program that works best for you, and watch employee morale improve. 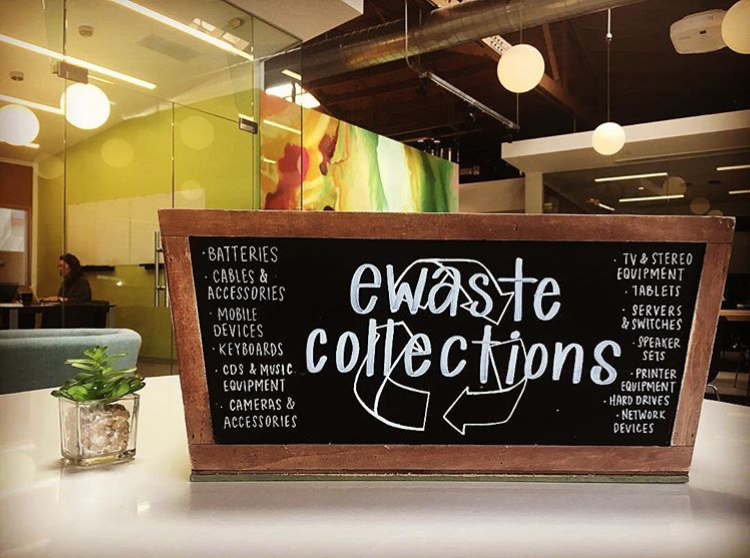 One of the simplest ways to reduce waste and green your business, is to reinforce recycling guidelines at your office. According to Rubicon Global, “The U.S. recycling rate is around 34.5%. If we’re able to get the rate to 75%, the effect will be like removing 50 million passenger cars from U.S. roads.” Trash sorting is one way that Eco-Leaders bring change to their community. Trash Sorting is implemented by Eco-Leaders around the world through our Waste Campaign. By staying informed about your local city recycling requirements, you can ensure that you are doing your part to re-purpose materials headed for the landfill. Resources such as Earth911 can help clarify what belongs in which bin. Contact us for opportunities to host a ‘lunch and learn,’ or for more ways to get your business involved in Grades of Green. Any business, whether providing a product or service, has to source materials, equipment, or man-power. One way to ensure your business is operating with sustainability in mind is to trace the source of your materials. Are the materials or man-power sourced in a way that is environmentally conscious and socially responsible? Is there another provider that is more eco-friendly at a comparable cost? Bagel breakfasts, vending machines, company coffee machines, and even water coolers can be waste perpetrators. Opt for zero waste snacks and bring reusable cutlery into your office’s kitchen. Purchasing a dishwasher and silverware may have a high up-front cost, but will actually reduce your expenses over time. Water coolers and company coffee machines are staples in most offices, but so are the little paper or plastic cups. Offer reusable ceramic or glass cups and mugs. By transitioning to a reusable-only office, each individual business location can cut waste maintenance costs. Next time your business goes through a big change or move, stop and think: who might benefit from resources no longer in use, such as office furniture and technology? Local schools can use out-dated desktop computers, monitors, printers, speakers, and other technology. Organizations like Habitat for Humanity and Red Cross will take donations such as furniture and household appliances. Renovating? Moving? Habitat for Humanity can even use your old sink or bath tub. Conduct an audit around your office. Are leaky pipes causing a steady drip in the warehouse? Are bathroom sinks constantly running? Fixing leaky pipes and switching to low-flow toilets/faucets, helps protects water and saves you money in the process. According to Rubicon Global, U.S. businesses use around 21 million tons of paper every year. Switching to paper-less billing, and incentivizing customers to enroll in paper-less statements, can reduce your paper waste significantly.If your restrooms have paper towels, switching to a hand-dryer can drastically reduce paper waste. Many businesses are realizing the benefits of going solar. Solar panels may have a hefty up-front cost, but they can significantly reduce energy costs within ten years’ time. When choosing an office location, settle on something that gets plenty of sun and has space for solar panels. Your office will be recognized for its conservation efforts, by consumers and employees alike. Your bottom line will thank you. When brining sustainability solutions into your office, remember the old saying, “if you want to go fast, go alone. If you want to go far, go together.” Partner with like-minded businesses to improving product sourcing, share an office building and split the cost of solar panels, work together to develop a commuting program that works for employees at both companies. There are countless ways to work with your community on sustainability issues. You can even invest in local student leaders, who are creating innovative sustainability solutions in your community. Businesses large and small are sponsoring Grades of Green’s annual VERTE gala to show their commitment to our planet. Your team of eco-minded employees can enjoy a night filled with live entertainment, a global tasting menu, silent auction, and so much more. Proceeds from the event provide environmental resources to student leaders all over the world. Join Grades of Green at the Westdrift Manhattan Beach Hotel on April 20th, reserve your table here.